The Metro Richmond Zoo’s mission is to promote animal conservation and educate and inspire guests. Like many other zoos and aquariums across the globe, animal conservation is at the heart of everything we do here at the Zoo. Animal conservation is the act of protecting animal species and their habitats for generations to come. The Metro Richmond Zoo strives to be a leader in animal conservation. Many animal populations are dwindling due to human poaching, habitat destruction, disease, and other factors. Through zoo breeding programs and conservation efforts, animal species can be preserved. The Metro Richmond Zoo is home to over 2,000 animals representing 180 species from around the world. The animals at the Zoo act as animal ambassadors for their wild counterparts to help inspire people to care about the survival of endangered and threatened species. The Zoo seeks to promote animal education and conservation through the unforgettable animal interactions we provide our guests. Our hope is that as our guests leave the Zoo, they will have a newly kindled desire to become involved in the protection of animals. The cheetah is Africa’s most endangered cat. In 1900, the cheetah population was around 100,000 individuals. However, due to habitat loss, human conflict, and illegal animal trade, the cheetah’s current wild population is in drastic decline. It is estimated there are around 7,000 cheetahs left in the wild. As of today, the cheetah inhabits only 23% of its historic African range. Cheetahs in the wild have an extremely high mortality rate. 90% of cubs die within the first three months of life. 50% of these deaths are attributed to predation and the other 40% fall victim to a lack of genetic diversity. Breeding cheetahs in captivity is very challenging. Only a small portion of the captive population reproduces. The Metro Richmond Zoo was up for the challenge. In 2011, the Zoo purchased 52 acres of land adjacent to the zoo property. We launched massive efforts in support of cheetah conservation. Construction began on the Cheetah Breeding Center (CBC), a private facility dedicated solely to the conservation of cheetahs. The CBC contains 10 enclosures for cheetahs. Construction on the CBC was completed in 2012, and seven female cheetahs arrived at the Zoo to join our two male cheetahs. In 2012, our cheetah population was 9. Four years later, our cheetah population was 35. On October 6, 2013, Lana gave birth to five cubs. This was the first litter of cheetah cubs for the MRZ. As of 2017, we have had 40 cubs born at the CBC from 8 different litters. These births have made significant additions to the cheetah population. Some of the adult cheetahs are unrelated to the other cheetahs in North America, so the genetic value of cubs for future breeding is extremely high. 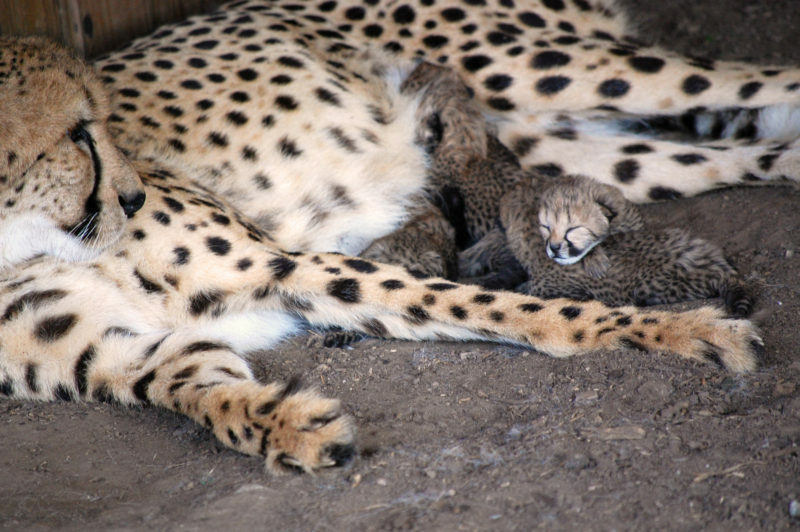 The Metro Richmond Zoo is proud of our tremendous success we have had with cheetah breeding. To accommodate our growing cheetah population, we are currently expanding our CBC to a total of 15 enclosures. 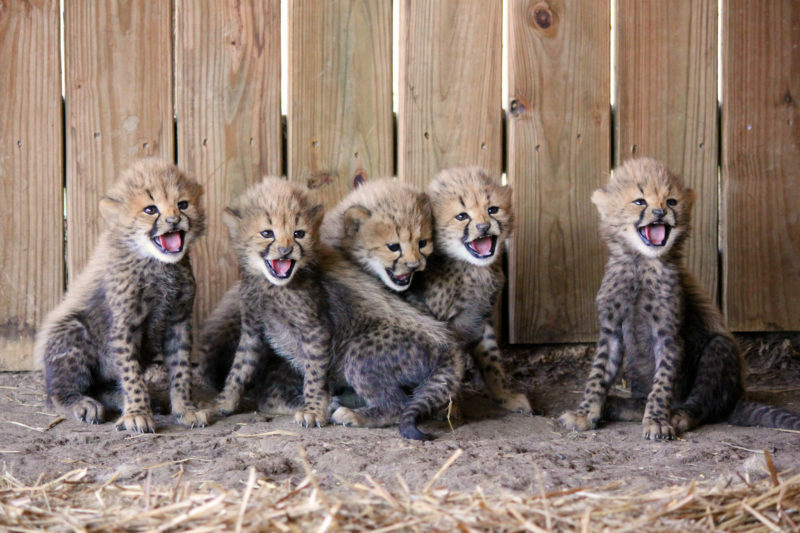 The Metro Richmond Zoo participates with ZAA’s animal management program (AMP) for cheetahs. Each year, the MRZ makes significant contributions to Cheetah Conservation Fund and Cheetah Conservation Botswana in Africa. Our visitor round-up donations are used to help our cheetah conservation program. The African penguin is native to the south and west coasts of Africa. The IUCN has listed African penguins as endangered. It’s estimated that the current population of African penguins consists of 70,000 breeding pairs; this is 10% of the population that existed in 1900. Their population decline is mainly attributed to oil spills, habitat destruction, and competition for food. In the wild, their average lifespan is around 15-20 years, but in captivity they can live much longer. The MRZ has one of the oldest penguins in captivity at age 37. Our African Penguin breeding program is one of the most successful in the country.Since 1996, 227 African Penguins have been hatched at the Zoo. Currently, the Zoo is home to 37 penguins. The Metro Richmond Zoo participates with ZAA’s AMP for penguins. The MRZ makes generous contributions to African Penguin and Seabird Sanctuary. The Diana monkey is native to the forests of Western Africa. It is one of the most threatened, yet least known monkeys in Africa. The US-ESA classifies the Diana monkey as endangered. Its wild population is decreasing due to habitat loss and hunting. Increases in human settlement in the native forested areas have caused drastic deforestation. In the wild, their average lifespan is up to 20 years, but in captivity they can live up to 35 years. We currently have 3 Diana monkey families at the Zoo with a total of 10 individuals. Since 1997, we have had 22 Diana monkey babies born at the Zoo. The Metro Richmond Zoo participates with the Association of Zoo’s and Aquariums’ (AZA) species survival program (SSP) for Diana monkeys. Meet Sully, a Diana monkey our staff hand-raised due to medical problems! In December 2016, the IUCN moved the giraffe conservation status from least concern to vulnerable. The report stated the wild giraffe population has dropped 40% over the last 30 years. This drastic population decline is attributed mainly to habitat loss, civil unrest, and illegal hunting. Since 1995, 14 giraffe calves have been born at the MRZ. On May 24, 2016, Elsa, a first time mother, gave birth to two snow leopard cubs after a three month gestation. This was the first litter of snow leopard cubs for the Metro Richmond Zoo. There is one male and one female cub. Nitro is the father. Snow leopards are considered an endangered species, with only an estimated 3,000-6,000 snow leopards left in the world. They are native to the mountain ranges of Central and South Asia. Snow leopards are nicknamed the “ghosts of the mountains” by natives because of their elusiveness, this could also be due in large part to the fact that they’re crepuscular animals, meaning that they are most active during dawn and dusk. The Metro Richmond Zoo participates with the AZA’s SSP for Snow Leopards. On January 11, 2015, Tasha gave birth to RJ, a male orangutan. RJ, named after his father, weighed approximately 4 pounds at birth, a healthy normal weight. The name “orangutan” comes from an Indonesian phrase meaning “person of the forest.” Orang means person and hutan means forest. These beautiful creatures are among some of the most intelligent animals in the animal kingdom. Unfortunately, they have been victim to poaching and deforestation, resulting in a critically endangered status. Deforestation for the establishment of palm oil plantations is the primary cause for habitat loss for orangutans. Female orangutans usually only have a baby every 7-8 years and will closely nurture their young for the first four years of their life.